37 yards (15 g) of aran-weight (#4 medium) merino wool in red for the cherries. Gauge 10.5 stitches and 8.5 rows to 4"
2. Continue crocheting the bag sides, working in the round and following the bag pattern. 3. Using the smaller hook, crochet the handles, encasing the wire. Whipstich the handles to the inside of the bag. 4. 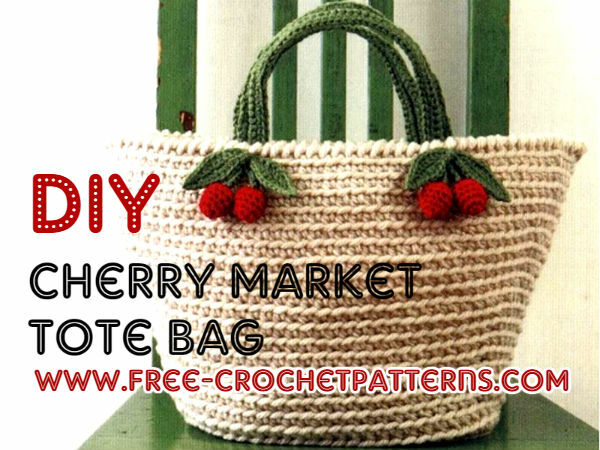 Using the smaller hook, crochet the cherries, stalks, and leaves,. Sew these pieces together, tehn sew them to the bag.